This week we were in Rugby at Brownsover Hall Hotel for the wedding of Nic & Matt. The venue was a Victorian Gothic mansion with striking interiors and lush grounds. Sadly, on this occasion the weather was not on our side, so we weren’t able to take advantage of the wonderful location and gardens it had to offer. Nic looked fantastic, with gorgeous ringlets in her hair and a dress which showed off her figure beautifully – whether she could breathe was another matter. The bridesmaids were dashing about touching up their make-up, the little boys relaxed playing around whilst the big boys (not so relaxed!) struggled with their cravats. The kids looked great in their little suits and shiny shoes. 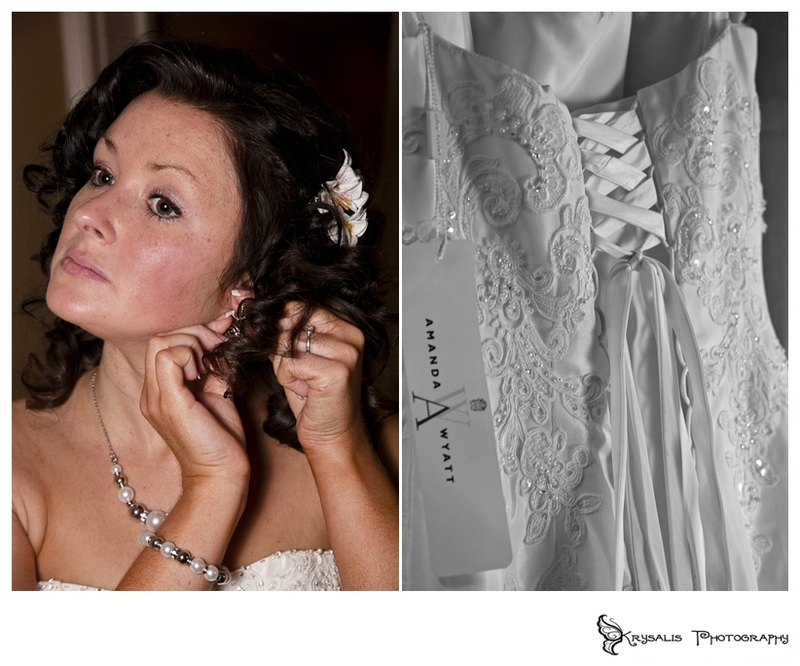 We took some detail shots of the rings, shoes and dress etc, though we mostly avoided the ladies before their make-up was finished, obviously we did get a few shots, as they all looked beautiful already. We then made our way over to the main building for the ceremony. Awaiting us there was a wonderfully designed room, full of anxious guests and a nervous groom. The moment of truth arrived and in walked Nic, accompanied by her son Joseph. We captured those crucial moments for prosperity. During the ceremony several people gave readings, which I thought was a nice touch and personalised the ceremony. Joseph did a splendid job of his reading (especially given he’s only 6). After the ceremony I dashed outside to find the clouds looming – the weather had not being good and I hoped we would get the break we needed. Sadly it was not to be. The rain came down and dashed all hope of exploiting the grounds, but we made the best of a bad situation and got the group shots we needed for the couple. Even though we had planned for poor weather we’d hoped we wouldn’t need to deal with it, sometimes its just out of your control. Once we had took the group shots, it was over onto the wedding breakfast. A few candid shots here before the food arrived and then leave them in peace for a while. The time came for the speeches – Matt had the honour of going first. All was going well until he spoke so fondly of his love for Nic, at which point she started to well up. Next up was Shelly, Nic’s sister, who too shared some warm-hearted sentiments, then onto the best man David…. …..Matt’s brother. He regaled everyone with stories of Matt’s past adventures and he was very amusing, despite his obvious nerves. We then stole the bride and groom away to get some personal shots. Again, this had to be done using indoors, however this was not a big problem as the interior of the hotel is gorgeous and there were plenty of areas to utilise. The hardest part for the newly-weds was having their guests watch them as we tested their memory on posing, and positioned them accordingly on the stairwell and balcony. Congratulations to Matt & Nic, enjoy your wedding photos, honeymoon and the rest of your lives together. Dade Freeman is a Brighton photographer producing portraits and headshots for actors, musicians, corporate business and other professional industries.